Rob Barber reflects on ‘big Friday’ when the Cribbar came alive in mid December 2016. 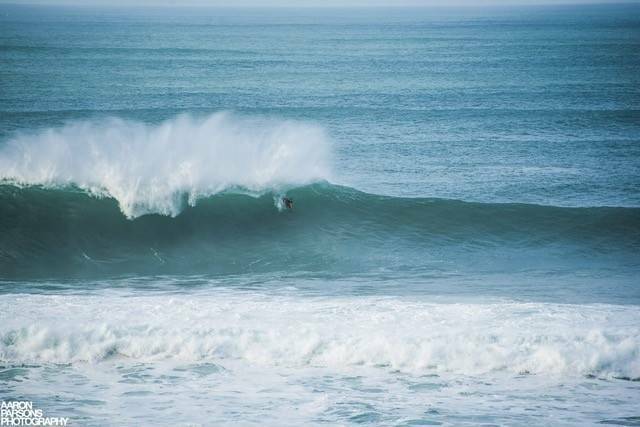 Having grown up in Newquay, I’ve come to know the Cribbar as everything from a mythical unrideable giant to a widowmaker of folklore, an unreliably fickle big wave spot, a revered tow-in only spot, and more recently Cornwall’s own Nazare. I’ve also witnessed it in all types of conditions and seen it go in and out of fashion with Britain’s best surfers and accompanying media fanfare. During these years, I’ve paddled out to Cribbar about 6 or 7 times and it’s been completely different every time. It’s hard to familiarise yourself with the line up as the peak is constantly moving around. It doesn’t seem to follow much of a pattern either, as it’s picking up swells from all different directions. Added to this, its’ sometimes savage rips means positioning yourself in the right area to catch waves can be quite demanding. On Friday the 16th of December rumour of the Cribbar awakening swept round Newquay like wildfire. Not wanting to get caught up in the tide of hype, I bided my time and waited until lunchtime as the wind was forecast to drop and I knew that it would be at its best at low tide. Over lunch I sat watching in awe as each giant set detonated with enough force to power our modest seaside town for a week. I noticed that it was the lefthanders that looked hollower and more makeable, and so after much deliberation I opted to paddle out from the north side of Towan Headland on the locally known Gazzle side of the peninsula. Once out in the line up I could see that it was easily the best day that I’d ever been out there. The waves had good shape, with irresistible wedgy peaks and even some barrelling sections. Previously I had only ever seen one or two other surfers out at the Cribbar when I’d been in the water. On that particular Friday I was surprised to see 8 or so other guys charging waves. It was refreshing to see such a diverse crew of wave riders in the line up, in fact the additional bodies in the water gave rise to a greater sense of security which in turn saw the guys really pushing the limits. There were Stand Up Paddle boarders getting some memorable bombs and a good mix of surfers and bodyboarders picking off some solid set waves. Everyone returned to shore unharmed and with some sizey waves under their belt to wax euphorically about at the pub. And so, ever since this memorable session there is now an undercurrent of confidence and child like excitement among Newquay’s surfing fraternity for the next big swell to hit the Cribbar. Watch this space!